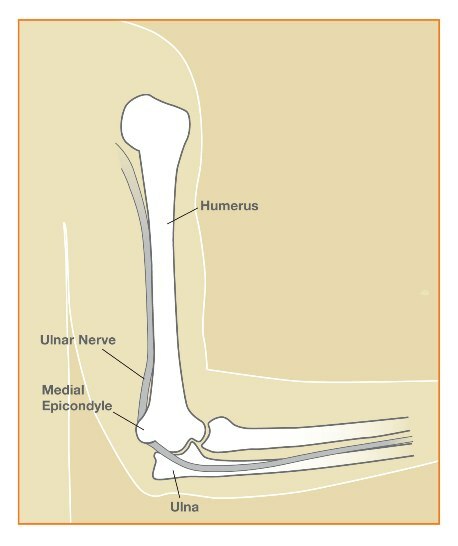 Cubital Tunnel Syndrome is caused by impingement of the ulnar nerve (the funny bone) as it wraps around the inside of your elbow. The nerve can be pinched by many different structures along its course. When the elbow is flexed, the ulnar nerve has to stretch around the back of the elbow, which can also cause problems. In some people, the nerve will pop in and out of the groove that it is supposed to be sitting in. Cubital Tunnel Syndrome leads to numbness and tingling in the small and rings fingers as well as pain on the inside of your elbow. Usually the numbness and tingling is intermittent and associated with the elbow being bent. Constantly resting the inside of the elbow on a hard surface, such as the armrest of a car, can also lead to symptoms. When cubital tunnel syndrome becomes severe, it can cause weakness and atrophy in the muscles of the hand. A history and physical exam by your hand surgeon is necessary to diagnose cubital tunnel syndrome as well as rule out other associated or alternative diagnoses. Nerve conduction testing is usually also performed to help determine the severity and confirm the diagnosis. In many patients, non operative treatment of cubital tunnel syndrome can be very successful. Braces are worn which hold the elbow in extension while sleeping. This can help patients’ nighttime symptoms as well as daytime symptoms by allowing the nerve to rest and not be stretched. An easy alternative to formal bracing is to wrap a shower towel around the elbow at night to resist flexion (bending) of the elbow. If non operative treatment is unsuccessful, surgery can be done to treat Cubital Tunnel Syndrome. An incision is made over the medial (inner surface) of the elbow, and any tight bands or constrictions are released. This is called a Cubital Tunnel Release or simple ulnar nerve decompression. If the nerve is popping in and out of the groove, the surgeon will move the nerve to the front of the elbow so that it no longer is a problem. This is called an anterior transposition. Both of these procedures are done as an outpatient. They typically require general anesthesia. Recovery from surgery usually takes about 4-6 weeks with gradual return of function and strength over that time. It can take longer for the nerve to heal and for the numbness and tingling to improve as nerve healing happens very slowly. If you have been noticing numbness and tingling to your small and ring fingers or pain/sensitivity of the inner part of you elbow, call Dr. Murch today at 715-847-2382 to set up an appointment.